In the past 48 hours, the Storefront Library collection has nearly tripled in size, with generous donations from The Learning Project Elementary School, Dawn C. Donovan, Hiroko Kikuchi & Jeremy Chi-Ming Liu, Virgina Ward, and many others. Adam Robinson, Brianna Belanger, and Lucy Borgheiinck from Simmons Graduate School of Library Sciences have volunteered hours of their time to unbox, sort, and prepare books for the shelves. 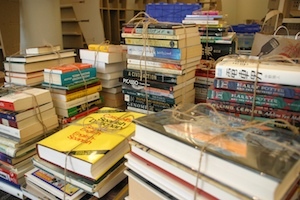 Donations of books are still being accepted—here’s how you can get involved.